Hardwood handle and brass ferrule. Diamond shaped blade is beveled on one side only. 175mm (7in) Marking knife. A heavy-duty scoring knife featuring a hardwood handle and brass ferrule. 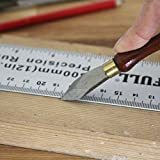 The diamond shaped blade is beveled on one side only, allowing the flat side close contact with a straight edge or cutting guide when laying out particularly across the grain of the wood.